The photograph above was taken in the summer of 1969. I had just graduated from high school, the summer before beginning college. For a graduation gift, I asked for a trip to Europe, and my parents arranged an experience that included stays in London, Amsterdam, and Paris followed by several weeks at the University of Grenoble (with day trips on the weekends) where I studied French, adding to five years of French in secondary school. It was a memorable trip, one that helped nurture a lifelong passion for travel. I brought my film camera along, a Minolta SRT 101 with several different lenses. Photography had been my avocation even as a teenager. My 1969 photo shows Picadilly Circus with the billboards as they appeared behind the Shaftesbury Memorial Fountain fifty years ago. Skip forward fifty years, and you can see the changes. There's now a LOT more traffic, and it would be impossible to capture the scene with no vehicles in the foreground. 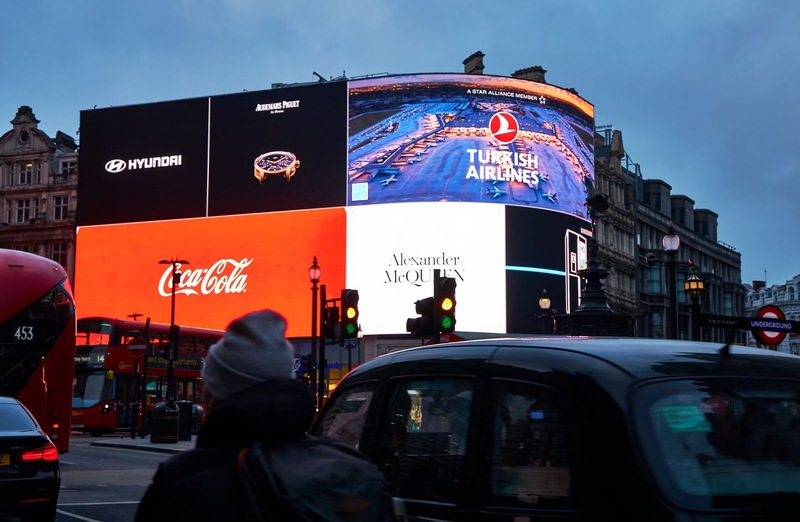 The static billboards have been replaced with ever-changing advertisements shown on LED screens. (Coca Cola is still the most prominent advertiser.) 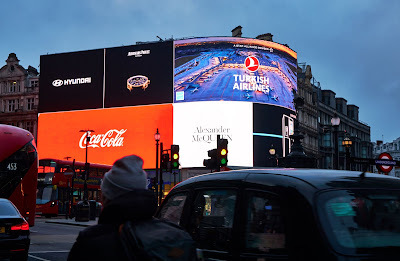 The displays move across the screen, and video snippets including an effervescent glass of Coke, a Turkish Airline plane landing in Istanbul, and advertisements from companies ranging from Samsung to Audemars Piguet, from Hyundai to Alexander McQueen. My suite at Hotel Café Royal (#422) looks right out onto the display, and I asked the housekeepers to keep open the curtains of my living room so that I could enjoy the 24-hour show. Travel creates the milestones of our lives. Each return visit brings back memories of experiences past and the hope for new memories to come.